The city of Los Angeles has some of the country’s most polluted air. It also has some of its most congested traffic. To address these problems, billions are being spent on mass transit projects, and various schemes are underway to shorten automobile trips and encourage residents to car pool and limit non-essential driving. So how should we regard the rapidly-growing phenomenon of mobile billboards mounted on trucks and trailers and driven through the streets or left sitting for days in highly sought-after parking spaces? As inevitable manifestations of commercial enterprise, or as destructive, anti-social assaults on our shared public spaces that ought to banned forthwith? 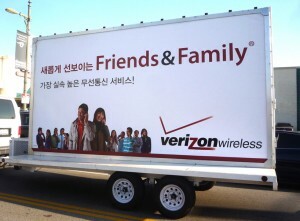 In Los Angeles, City Councilman Dennis Zine has authored a motion that would have the city council direct the City Attorney to present a draft ordinance to ban mobile billboards. That motion, co-sponsored by Councilman Paul Koretz and seconded by Bill Rosendahl, was made on Sept. 1, 2008, but the City Council has not taken any action on it. As of now, no regulations apply to truck or trailer billboards moving through the streets. 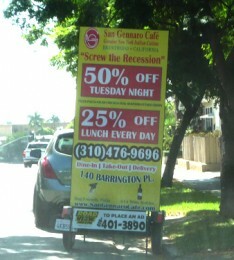 Parked billboards can be cited and towed if they aren’t moved in 72 hours, but only after notice is given. These parked billboards can also be cited on streets where signs prohibiting “unhitched trailers” have been posted. Because the billboard companies typically move the signs from place to place before 72 hours expires, and residents have to request the posting of the unhitched trailer signs, these regulations are basically meaningless. You have a few facts wrong. 1. The City of Los Angeles does not provide any notice before towing any vehicle. This includes those that are “alleged” to have been parked over 72 hrs. The City’s illegal ordinaance that implemented the CAVC section 22651K in the City (as required by the CAVC) was ruled un-constiutional by Federal Judge Matz in the US Ninth Circuit court in 2006 as the City’s ordinanvce required driving one mile and not parking 72 of an agreggate 73 hrs. The CAVC specifies that a vehicle may not be parked over 72 hrs. period. 22651K also requires a City to have an ordinance implementing 22651K Th new LA ordinance implements the CAVC as written. 2. The CAVC section# 21 specifically prohibits a City or County from enacting an ordinance that is not expressly permitted by the CAVC. So not only is there no provision in the CAVC for the City’s “no unhitched trailer parking” ordinance, the “sign trailers” do not meet the def of either the CAVC 630 or the LAMC definition of trailers. In addition the CAVC does not define “hitched” ergo they cannot be determined to be “unhitched”. 3. The placement of the “no-unhitched..” are done by the City street services. They do not conform to any plan other than “collector streets” and are placed because the City Councilman of the area requests them. The residents have no say so over the posting on the street they may live on. So those are some of the facts you missed. May I ask a few questions? If you are opposed to “visual blight” why would you advocate that the City post SIGNS prohibiting sign-trailers? Does it make sence to post thousands of signs to attempt to prevent the placing of dozens of signs? Have you calculated the cost of theses signs? The City places 4 to a block, 8 blocks to a mile, two sides to a street. The signs cost the taxpayers appx $250 for the sign, pole, erection of the sign, engineering, planning and record keeping.That works out to $16,000 per linear mile.100 miles of streets equals 1.6 million dollars! Meanwhile the $160,000 needed to repave a mile of City streets is so lacking that the City is reapaving on a schedule of once every 120 years! The streets may crumble, but there will be signs prohibiting those unhitched trailers! !